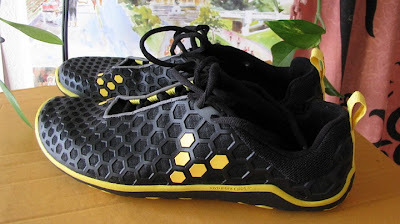 Isn't it fitting that I would love a pair of shoes with a honeycomb pattern! I was originally sent a pair of the navy but found them to be a smidge too small so sent them back. I do appreciate however that I got a chance to check them out and I found them to be very attractive shoes! As far as aesthetics go I love the style and colors available in the Evo IIs. They are fashionable as well as practical. They look good both running and wearing about casually. I like shoes with a bit of flair. Something that makes them stand out and these fit that description and yet at the same time are sleek and versatile. The website says that they run a bit small and of course I missed that when ordering mine. So make sure you learn from my mistake and order up a size! 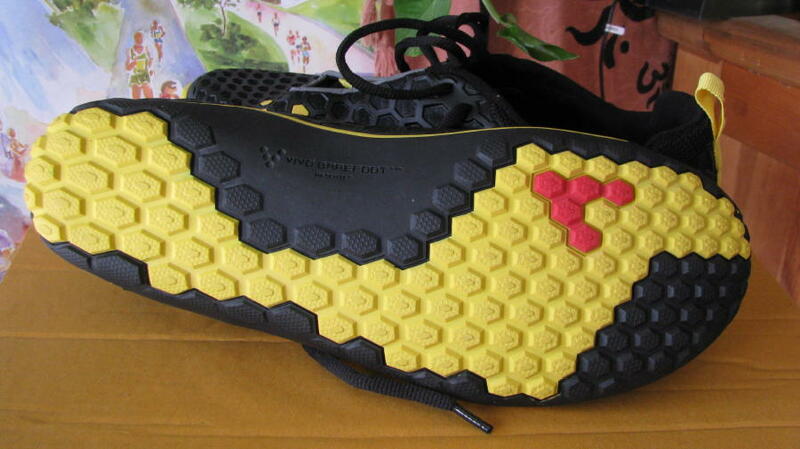 I based my sizing on my VFF KSO Treks. I wear a size 41 in those.I discovered that I wear a 42 in the Evo's. The Evo IIs fit perfectly both in width and length. I have found that it's not as common as one would think to find a shoe that fits well both in width and length but the Evo IIs have accommodated both of those aspects perfectly. The shipping was prompt and the packaging is very nice. Usually the packaging is not something I pay much attention to but these were well done and worth sharing about. I removed the insoles first before trying them on. The less padding and the more ground feel the better for me. 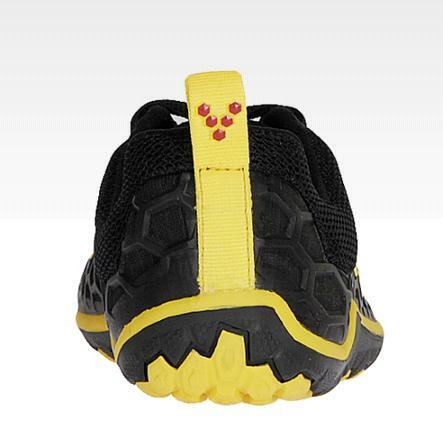 They come with a removable and washable recycled memory foam insole. 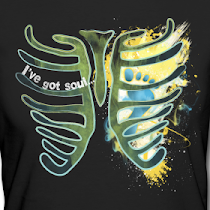 They also have a 50% recycled antibacterial lining. The seams are sewn ergonomically to result in zero rubbing so no worries with comfort in going without socks. They weigh in at 7.5 ounces according to my kitchen scale and have a 4mm puncture resistant sole with a fantastic honeycomb pattern. 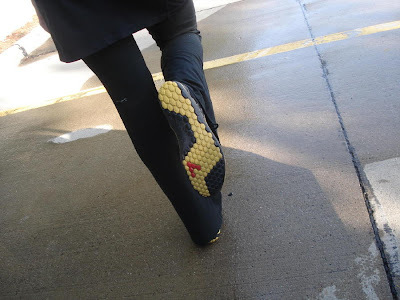 The arch area is very comfortable and flexible and didn't inhibit my running or walking in any way. 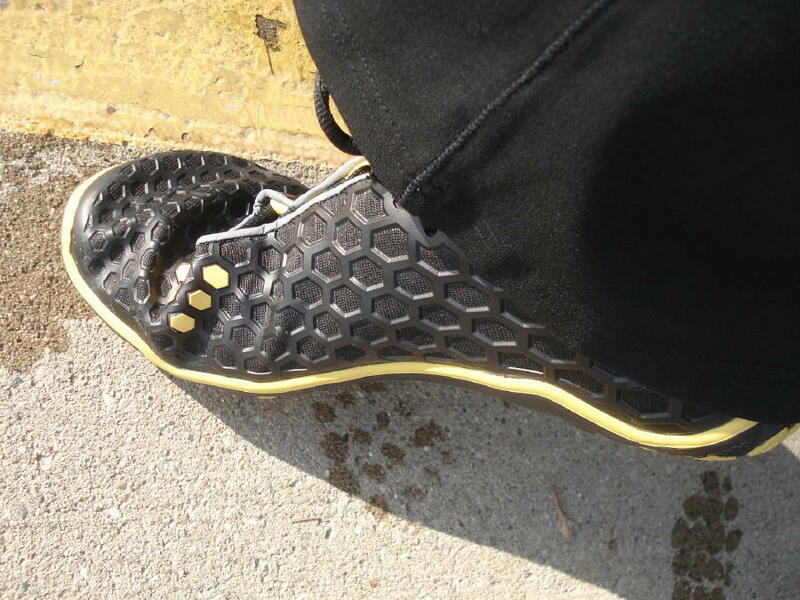 There is no arch support of any kind in either the insert or the shoe iteself. In other shoes I have noticed that the protection on the medial side of the sole is a distraction however the Evo IIs were unobtrusive overall. As you can see these are very flexible. Sometimes its hard to tell from photographs how well the shoe can move and bend. 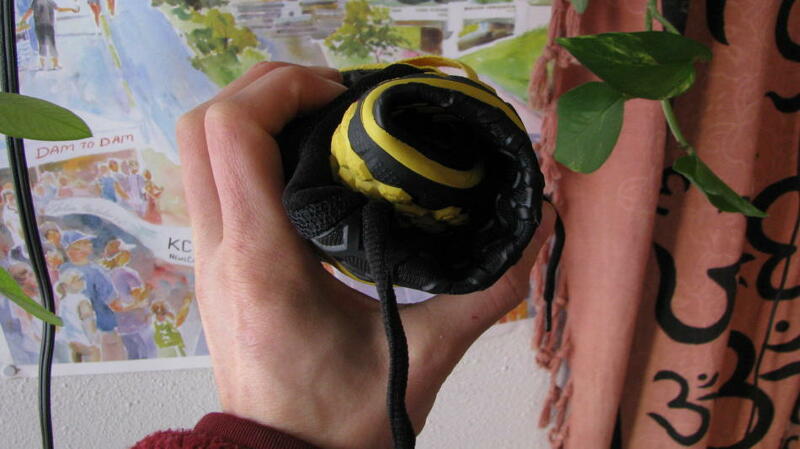 The roll it up in a ball test does the trick and is the first thing I do when I get my hands on minimal shoes. My toes are not forced together and when my foot lands. My forefoot and toes are able to splay naturally and uninhibited. The upper consists of a nylon mesh surrounded by a TPU cage for added warmth and water resistance. 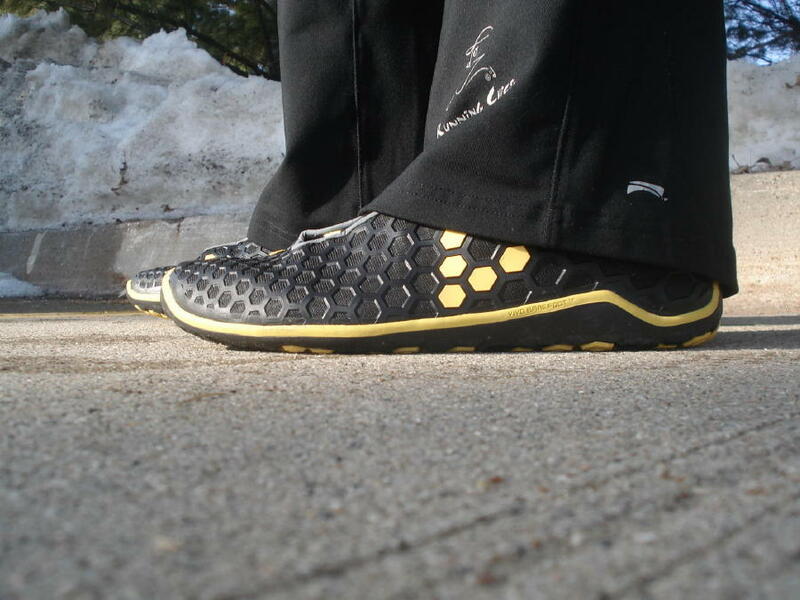 The Evo IIs are a flat shoe encouraging the foot to move the way it is intrinsically made to move. One of the downsides to this is that it can sometimes cause rubbing where the shoe flexes. I think this is mostly dependent on each individual foot. As you can see in the below photo there is a crease across the first metatarsal area. The crease goes across all of my toes but only rubbed on the big knuckle of my big toe. I had issues with it only on my left foot and I think that as they break in more this will decrease. I do not have any issues with this while wearing socks and a piece of medical tape is an easy fix for wearing them without socks. I think that the trade-off of wearing a piece of tape instead of having a toespring is worth it in the big picture of a shoe helping instead of hindering. There is nice padding at the heel tab. (heel tab is the area at the back of the heel area that sits at the Achilles tendon) There has been no rubbing and it is short and flexible enough not to cause any discomfort. The lacing system provides tightening flexibility based on the terrain and activity. As far as terrain goes, the Evo IIs have become my favorite road running shoe as well as my favorite to wear out and about. The flat sole and low yet grippy traction is what I want most in a road shoe. On dry trails, even technical trails, the traction is great although on a slick trail I would choose a trail shoe that had some sort of lugs for better grip but only if there was a lot of mud involved. They did well in snow although I have yet to find a minimal shoe that does well on ice. I just avoid ice altogether. I have been testing these in the harsh winter months here in Des Moines Iowa. We have had very cold days and much snow. I was warm enough in the Evo IIs at temperatures below freezing with a pair of Injini wool socks. The Evo IIs have excellent breath ability and I have no doubt that they will be equally as comfortable in the hot months of summer without socks. They certainly proved to be comfortable without socks above freezing. One of the downsides to minimal shoes is that the minimal sole does not protect well from the cold seeping into your feet from the ground. The key to overcoming this is to keep moving!! VIVOBAREFOOT is much more than just a line of shoes. It is a whole way of approaching running. 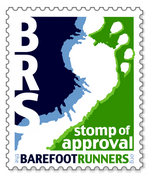 They have a great online community and videos about how to start barefoot running by Lee Saxby. So having been offered the shoes to try out for free lets me decide without bias whether or not I would have been happy spending the money on these shoes. I am able to be very picky and consider all aspects of the product. I most definitely can justify the cost of the Evo IIs. They are well made and do not hinder my barefoot form. They are the first shoe I grab when barefoot running is not an option! That was a really good review. It's a cool looking shoe but I must say the most impressive part for me was when you rolled it up! I really like my Evo's too. I was surprised at the ground feel although I think mine might be almost too small. Do you like them better than the Merrill's? Great review -- those a nice looking! 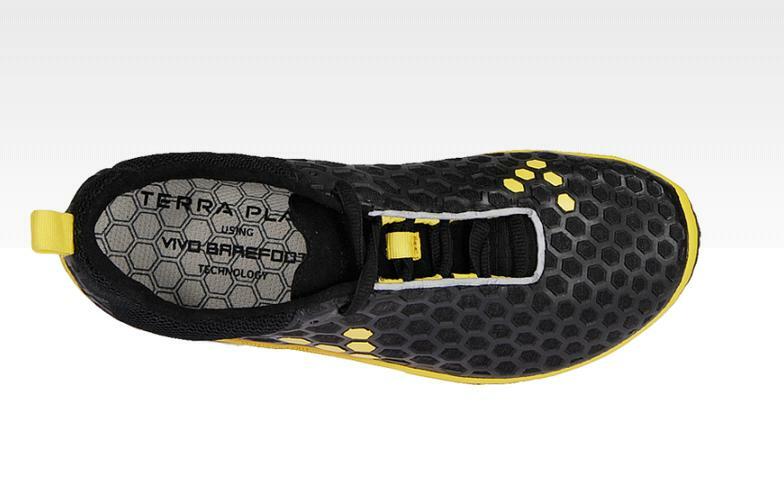 (Sometimes I think the vibrams are so freaking silly looking, I'd be more likely to consider a minimalist shoe that looks like a shoe). Jen, I like them much better than the Merrells for road running and the Merrells for trail running more than the Evo's. Beautiful review, I have never seen those shoes before, but they look beautiful and comfortable. Hey Angie - I just got a pair of minimalist shoes and I wondered if you could give me some tips on working in slowly. If you have a chance to comment, I would appreciate it a lot! Thanks Angie! I appreciate it! And I totally channeled you and your beads the other day. I didn't have any beads so I just rubbed my fingers against each other and repeated my mantra. It totally helped relax me and get my breathing under control. A mile flew by and I didn't even notice it. Thanks for all your tips! No mention of price? That alone is reason I won't be buying. I have a long narrow foot size 11. I just ordered merrel pace gloves and they fit width, but are too short. These are men's shoes right? Are they wider then women's?